(Nanowerk Spotlight) Complex surfaces with precisely fabricated three-dimensional (3D) micro- and nanosized features are needed in applications in electronics, metamaterials, substrates for cell culture and tissue engineering, smart active surfaces, and lab-on-a-chip systems. Although there are several methods of fabricating 3D microstructures – lithography techniques, capillary forming, 3D-printing, or direct ink writing – all have their drawbacks, requiring trade-offs in feature geometry, heterogeneity, resolution, and throughput. "Existing fabrication techniques for 3D microstructures usually suffer from complicated equipment, time-consuming processes, and insufficient controllability on precise structures,"Yanlin Song, a professor at the Institute of Chemistry, Chinese Academy of Sciences, and Director of Key Laboratory of Green Printing, tells Nanowerk. "Constructing controllable 3D self-assembly microstructure in a simple and convenient way is still a challenge." 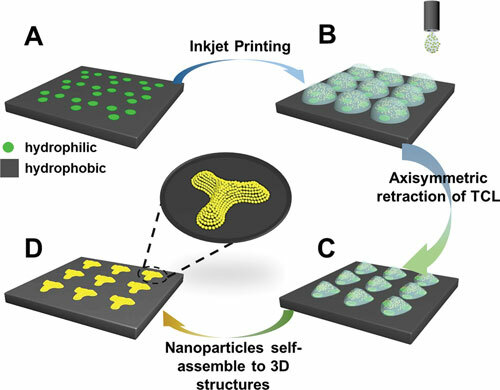 In new work, reported in the February 16, 2015 online edition of Advanced Functional Materials ("Printing Patterned Fine 3D Structures by Manipulating the Three Phase Contact Line"), Song and his team propose a facile strategy to directly assemble nanoparticles into controllable 3D structures from one microdroplet based on 0D hydrophilic pinning pattern. The scientific core of these findings is that 0D patterns – hydrophilic pinning dots on hydrophobic surface – are used to print 3D structures by controlling the dynamic asymmetric dewetting of the three phase contact line (TCL) based on energy difference. This novel fabrication technique utilizes asymmetric dewetting of TCL of hydrophilic patterns to fabricate 3D structures with controllable morphologies for the first time. "The preparation of fine 3D microstructures is an attractive issue, however, it is limited at large-area fabrication process and fineness morphology manipulation," explains Song. "Here, our strategy to fabricate controllable 3D structures and morphologies can be done from one droplet via ink-jet printing. The whole process can be easily handled and the morphologies can be well manipulated." Previous approaches fabricated structures only from replicating: they mainly focused on restricting structures at the hydrophilic region, whose morphologies rely on the shape of hydrophilic patterns. So far, there has been no report using patterned hydrophilic pinning dots to direct the fabrication process of 3D structures. Compared to these previous results, in this new work, the hydrophilic dots were used as pinning dots to control the dynamic asymmetric dewetting of TCL. This process leads to the assembly of nanoparticles into various 3D morphologies with closely packed structures. "Through the cooperative regulation of liquid properties and the pinning points? parameters, we are able to precisely design and control the 3D morphology," notes Song. He elaborates: "Generally, nanoparticles pack tightly on a hydrophobic surface, on which the droplet has a large surface receding contact angle (θR), while pack loosely on a hydrophilic surface with a small θR." Closely packed morphologies are assumed to have superior properties for practical applications, and numerous efforts have been made to achieve a uniform deposition by adjusting particle shapes and regulating capillary flow. By manipulating the retracting TCL by 0D hydrophilic patterns, the team controlled the assembly of nanoparticles on the hydrophobic region with large θR as well as on the hydrophilic region with small θR to achieve a hexagonal closely packed structure. 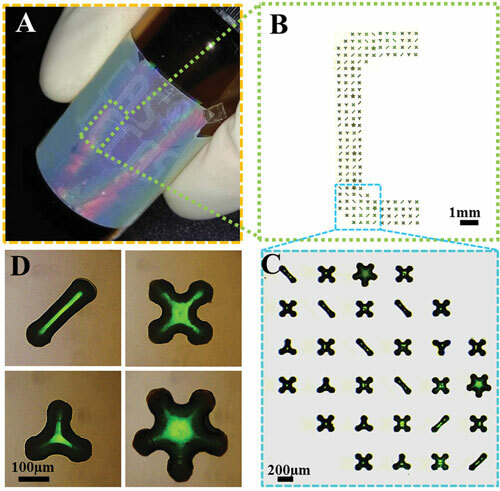 In their experiment, the researchers directly printed 3D colloidal crystals from a single microdroplet on manually designed hydrophilic pinning patterns. By designing the 0D hydrophilic pinning patterns, they prepared different 3D microcolloidal crystals with precise morphologies, including line, triangle, square, star, hexagon, and octagon. "Encouraged by the controllable morphologies and photonic properties of the 3D microcolloidal crystals, we designed a macro/microhierarchical structure color pattern, which is of great significance for the fabrication of multi-information carriers or anticounterfeiting materials," says Song. "The printed 3D array displays bright structure color even with the existence of reflective rainbow color. The composition, morphology, and location of each single 3D structure as well as their permutation and combination could be well manipulated, which is of potential use as multiprotocol optical codes." As well-defined 3D architectures can lead to collective functional properties, the as-prepared hierarchical pattern will be promising for the development of novel 3D photonics and other functional devices. "In the future, our strategy can be applied in guiding the morphology of bio-materials, which will be encouraging for 3D biological manufacture and further applications in bio-engineering," says Song. "In this present paper we utilize surface energy difference to manipulate TCL of droplets. Likewise, surface energy differences can be utilized to control adhesion of proteins, cells, or bacteria. Take cells for example: Firstly, this method could direct cell assembly onto predetermined locations and into different morphologies. Secondly, the morphology of a single cell itself can be directed by a predesigned pattern." Song's group is focused on developing new technologies to print nanomaterials, especially nanoparticles, to assemble microstructures from 0D to 3D. Another recent example of their work is a controllable strategy to print precise 3D microstructures via 2D interface manipulation of droplets on surfaces with tunable dynamic dewetting properties under magnetic guiding ("Interface Manipulation for Printing Three-Dimensional Microstructures Under Magnetic Guiding"). Song points out that the challenges facing future research in this area could be the substrate fabrication process, which should be bio-friendly. Also, the regulation of adhesion between the substrate and the bio-materials or the nutrient substance culturing the bio-materials is a difficult problem to manipulate. But no matter what challenges may exist, the key point of this strategy is to use difference to manipulate morphology, which is facile and controllable.